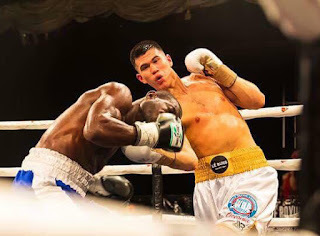 Press Release: August 30, 2018 by Sanman Promotions – Sanman Promotions prospect John Vincent Moralde is 100% prepared to face American Olympian Jamel Herring. The fight will be for the IBF-USBA Super Featherweight Title and will be held at the Savemart Center in Fresno, California. It will in the undercard of the Ramirez vs Orozco fight and will be televised via ESPN Plus and is being promoted by Top Rank. Moralde has been in the US since August 9 and has been under the watch of Wildcard Gym resident trainer Rodel Mayol. 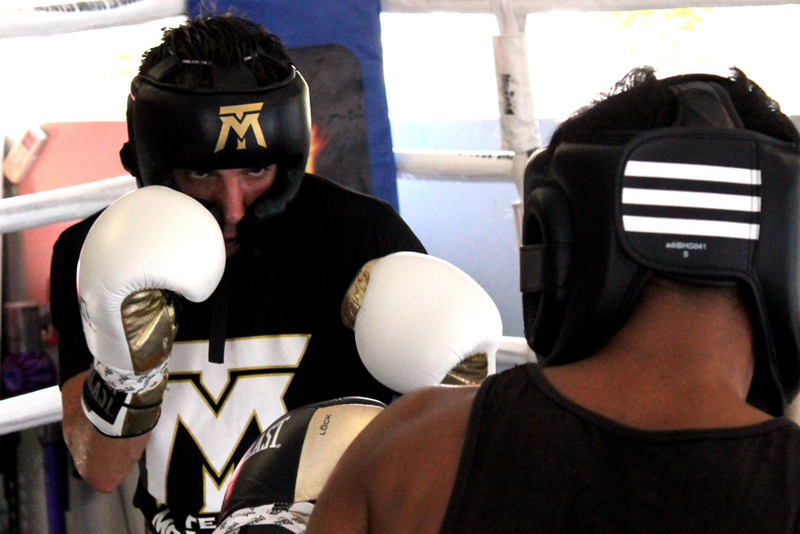 Prior to flying overseas, Moralde has been busy training at the Sanman Gym in General Santos City. This is Moralde’s second fight in Fresno having beaten formerly undefeated Ismail Muwendo. “I am in great shape having trained in the US for more than a month. My training camp with coach Rodel has been excellent. Fighting at 130 pounds is most comfortable for me. I think it is the perfect weight. My opponent is an amateur veteran and an Olympian and should not be taken lightly. But I will do everything to bring home the belt. Thanks to Sanman through sir JC Manangquil for this break”, Moralde stated. Sanman Promotions CEO Jim Claude Manangquil thinks this is so far the biggest fight for Moralde. A victory will bring more and bigger fights on the table including a possible world title fight. 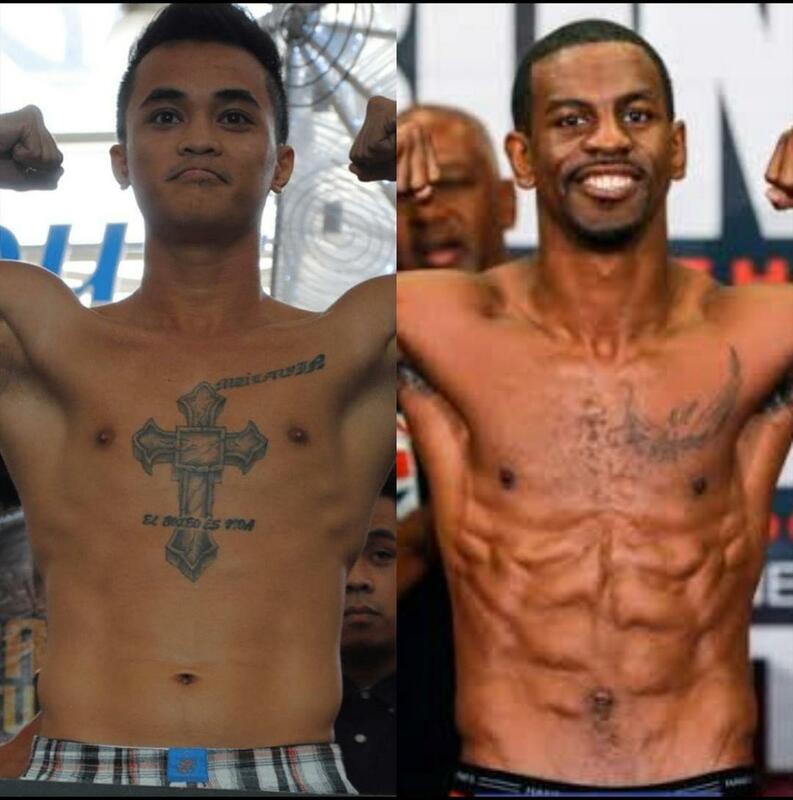 “Herring is a great fighter and Moralde needs to be in top shape to beat him. We are however confident he can pull off another big win”, Manangquil said. 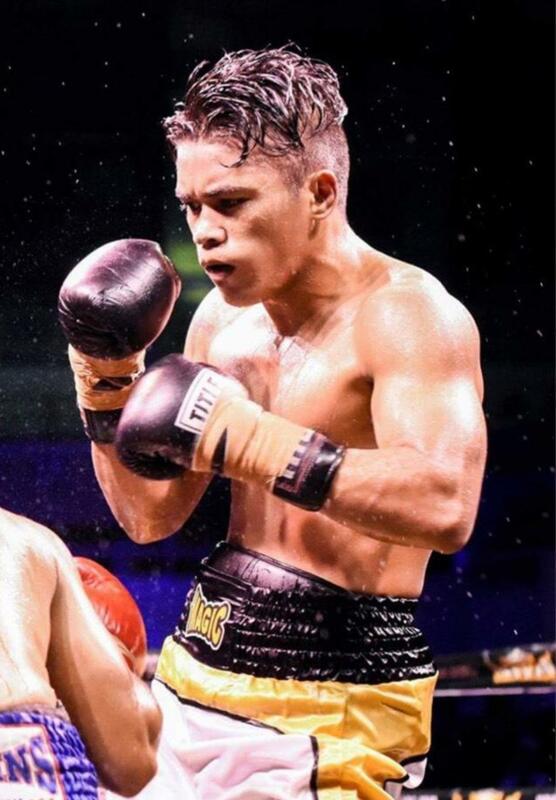 Press Release: August 29, 2018 (Originally released August 28, 2018) by Sanman Promotions – Sanman Promotions fast rising prospect “Magic” Mike Plania W15 L1 D0 will have a chance at grabbing a WBC Asian Super Bantamweight Belt when he faces fellow Filipino fighter Angelito Merin on September 9, 2018 in Polomolok, South Cotabato. Plania is a multi-medalled member of the Philippine Amateur Boxing Team and has fought in Ukraine for the AIBA World Youth Tournament. He has also won several gold medals in national competitions. When he was in Miami, we was paired as sparring partner to Cuban Champ Guillermo Rigondeaux. He has earned the attention of the international boxing media when he knocked down former world champion Juan Carlos Payano but lost via decision. “I was very upset with the Payano fight. I thought I won but it was close. Payano had the experience advantage. It was unlucky to have my record tarnished in a fight where I knocked down my opponent. But I am a warrior, we all loss at some point but we should move on and keep on winning till we get what we want. I want to be a world champion and I wont stop chasing that dream. I am in great shape now. I am sparring with Marjohn Yap and Shohei Omori. I am determined to take that belt. I need this win to get the bigger fights in my division. I am always grateful to my manager JC Manangquil of Sanman Promotions ”, Plania said. According to Sanman honcho Jim Calude Manangquil, it is their goal to make more world champions from their stable. They currently have WBA Interim Bantamweight Champion Raymart Gaballo, highly rated contender Romero Duno, and former WBA interim Light Flyweight Champion Randy Petalcorin who bear the banner of Sanman Promotions. For more information about Sanman Promotions and to watch the Sanman Live Boxing series please visit Sanman Promotions official Facebook page: www.facebook.com/SanmanPromotions. Two world championship fights showcasing Boxing’s Jr. Featherweight and Lightweight divisions on August 25th at the Gila River Arena in Glendale, AZ which could impact each respective division going into 2019. In the first of these world championship bouts, undefeated World Boxing Organization (WBO) Jr. Featherweight world champion Issac Dogboe stepped into the ring to make the first defense of his crown, which he won in April of this year with an eleventh round knockout of Jessie Magdaleno. The Ghanian-born, London, England-based Dogboe faced what appeared might be a stern test in the form of thirty-seven year old WBO number six rated contender Hidenori Otake of Japan. Otake, who had a respectable record of winning thirty-one of his thirty six previous professional fights coming into his challenge of Dogboe certainly had experience on his side having previously held the Japanese Jr. Featherweight championship as well as holding the Oriental Professional Boxing Federation (OPBF) Jr. Featherweight championship, a title where he had made three successful defenses prior to this fight. Despite Otake’s experience and ability to go rounds having scored knockouts in fourteen of his thirty-one career victories, one could have questioned whether he would be able to withstand Dogboe’s power over the course of the fight given that the recently crowned world champion had knocked out thirteen of his previous nineteen opponents registering a career knockout percentage of 70%. What normally is of interest to this observer whenever a new world champion makes their first title defense, particularly a world champion who won their championship in impressive fashion as Dogboe had is to see if whether winning the world championship will somehow influence their approach going into defending the crown. While the term “Influence” may lead some readers to think that yours truly is referring to the fighter’s preparation going into the fight as sometimes can indeed be a topic of discussion prior to a fight, that is not what I am referring to in this instance. In this case the word “Influence” simply refers to the fighter’s intent coming into battle. Obviously, the intent of any fighter who steps into the ring should be to perform well and aim for victory when all is said and done, but what I am referring to is more in regard to how the fighter approaches the task at hand, the combat. Whether said fighter will be tentative in their approach perhaps with the intent to not be as aggressive and to study what the opposition’s approach might be and gradually implement a strategy over the course of several rounds, or whether the champion will seek to make as big and loud of a statement as they did in winning the world championship. Dogboe’s approach in this fight could be best described as “Systematic” in that once the bell rang to begin the bout, he simply went to work. No gamesmanship, no attempt of psychological tactics to get in the mind of his opponent, just simply going about his business, awaiting his opening, and taking advantage of that opening once it presented itself. Using a body/head attack, Dogboe landed consistently to the challenger’s body with hooks and uppercuts to the head and through Otake’s high defensive guard. This eventually created an opening for the champion to drop Otake with a flush left hook to the head. Although the challenger was able to get up from the knockdown and got up from a second knockdown as a result of a follow-up barrage by Dogboe, Otake simply had no answer or way to weather the storm of the champion’s offense forcing Referee Chris Flores to stop the fight at 2:18 of round one. There simply is not much one can say about a fight that lasts just over two minutes, but Dogboe’s performance in this fight was the type that both fighters, a fighter’s management, and a fighter’s promoter love. A statement making performance after an equally significant statement making performance in winning the world championship via impressive knockout. What this means for Dogboe is not only has he demonstrated the traits that a network looks for when they are seeking to broadcast fights featuring fighters with entertaining styles, but also it is those types of performances that usually generate buzz and creates interest among the ultimate authority, the Boxing fan. While it may be too soon to name Issac Dogboe as Boxing’s next breakout superstar, he has established himself as a fighter to watch, who’s star is definitely on the rise. In terms of Dogbe’s future in the 122lb. Jr. Featherweight division, there are certainly potential options that could lead to possible unification of the division down the line. As for the near future, it would not surprise me to see Dogboe face a mandatory challenger as mandated by the WBO in his next title defense to fulfill the world champion’s annual mandatory defense obligation before possibly setting his sights on perhaps recently crowned International Boxing Federation (IBF) world champion Ryosuke Iwasa or even a potential move up in weight to the 126lb. Featherweight division. The second world championship fight that took place on August 25th featured a recently crowned world champion who was also making his first title defense. WBO Lightweight world champion Ray Beltran. Beltran is a longtime veteran of the sport, who has not always come out on top in some particularly close fights throughout his career. This would change however, in February of this year when after forty-three professional fights, Betran defeated Paulus Moses to win the vacant WBO Lightweight world championship previously held by Terry Flanagan. For his first defense as a world champion, Beltran would face WBO number two rated Lightweight contender Jose Pedraza. In a similarity to Issac Dogboe, I wondered how the thirty-seven year old Betran would approach this first title defense. After all, Beltran has experienced the highs and lows that come with a long and grueling career as a fighter. The champion had also faced struggles outside the ring as the Los Mochis, Mexico native endured a long battle to obtain citizenship here in the United States. Without going into the particulars of Beltran’s battle outside of Boxing, it was still logical to question what effect the highs, lows, and stresses the champion had gone through both in and out of the ring had taken on him. While fighters and by extension all athletes are gifted with their respective talents, they are all human as the rest of us and it would frankly surprise me if there wasn’t at least a little toll that had been taken on Beltran given everything he had been through. In terms of the opposition that stood across the ring from Beltran, Jose Pedraza had established himself as a top contender in the normally talent-deep 135lb. Lightweight division. The challenger entered this encounter with Beltran having won his previous three bouts and had only lost one of twenty-five professional fights coming into his fight with Beltran. In Pedraza’s lone defeat he was stopped by undefeated world champion Gervonta Davis in January of last year in the 130lb. Jr. Lightweight division. When two fighters square off, who each come into a fight having built significant momentum, it is always interesting to see which fighter will take the initiative. Sometimes in Boxing, a fight can be summarized in simple terms. This was a tactical battle where the story quickly became Jose Pedraza’s ability to use lateral movement, switch between a southpaw and orthodox stance, to time his opponent, and finally mix up his offense. While the champion Beltran was able to have his moments periodically throughout the fight, his normal strategy of looking to apply consistent pressure and gradually break an opponent down over the course of a long fight did not work to his benefit in this bout. The challenger was the fighter who consistently got his punches off first, tied Beltran up and made it difficult for the champion to get off with his offense and/or evaded the majority of Beltran’s punches. Pedraza’s performance was highlighted by dropping the champion in the eleventh round with an uppercut. At the end of the twelve round world championship fight I had Jose Pedraza winning it nine rounds to three or 117-109 in points with a 10-8 round in the eleventh because of the knockdown. Official judges Robert Hoyle and Lisa Giampa turned in scores similar to this observer of 117-110, why the third official judge Ruben Taylor turned in a slightly closer score of 115-112 in points or seven rounds to five with a 10-8 round because of the knockdown against Beltran in round eleven. All three of these scores were unanimous awarding the fight and the WBO Lightweight world championship to the new champion Jose Pedraza. While this card featured two fighters that appeared to be on the verge of some significant paydays, one of those fighters, Ray Beltran suffered a setback. While the old-adage of “Styles Make Fights” certainly can be applied to his loss to Jose Pedraza, Beltran is a fighter who has shown throughout his career that he can bounce back from bumps in the road. This is likely the beginning of the next chapter in the incredible story of Ray Beltran and it is certainly not out of the realm of possibility that he will remain in the world championship picture going forward. As for Jose Pedraza, he appears to be in line for one such payday that would have been available to Beltran had he been able to retain the world championship that Pedraza now holds. A World Lightweight championship unification bout with three-division world champion and current WBA Lightweight world champion Vasyl Lomachenko, which could take place as soon as December of this year. Although it is likely that Pedraza would be considered an underdog if that fight is signed, the new WBO world champion has shown that he is comfortable in that role and if Lomachenko were to underestimate him, it could be a big mistake given what Pedraza showed he can do in his victory over Ray Beltran. Two world championship fights in the Jr. Featherweight and Lightweight divisions. Issac Dogboe, a world champion who’s star is continuing to rise, Ray Beltran, a world champion who’s story now faces a new chapter after the loss of his world championship, and Jose Pedraza, the top Lightweight contender who had been rebuilding his career after suffering a loss rising up to become a world champion and now appears to be in position for an even bigger moment in his career. Three separate stories that the Boxing world and it’s fans will no doubt remain interested in going forward. The types of stories that Boxing tends to love. We will see what happens in the next chapter for each fighter. Press Release: August 25, 2018 (Originally released August 23, 2018) by Sanman Promotions – Super-Bantamweight prospect Ben Mananquil W16 L1 D3 gallantly fought Japanese foe Hinata Maruta W7 L1 D0 in a close contest that ended up in a split draw. 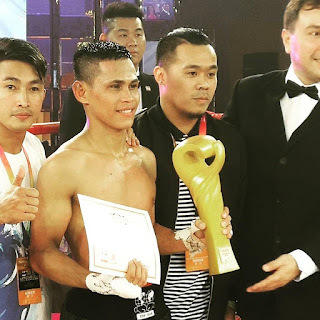 The warrior from Sanman Stable of General Santos City negated the six-inch height advantage of Maruta by capitalizing on his speed. Mananquil worked on the body of the lanky Japanese but was just too durable to go down. “I believe I did enough to win the decision. I know it was close but I got him despite his height. It was difficult but I knew I could beat him”, Mananquil stated. The event was staged at The Flash Grand Ballroom, Elorde Sports Complex, Parañaque City. Material Courtesy of: Sanman Promotions/ Photo Courtesy of: Real Fight PH Used with Permission. For more information about Sanman Promotions and to watch the Sanman Live Boxing series please visit Sanman Promotions’ Official Facebook page: www.facebook.com/SanmanPromotions. Press Release: August 22, 2018 by Latoya Karwigi - On the 21st of September 2018, at the Big Top Arena Bigger Than Life Entertainment and Real Steel Promotions will be hosting the Making A Champ Series for the very first time in Johannesburg, South Africa. The action packed night will feature American Heavyweight Carl Davis Jr. ready to fire up the ring in his first South African Fight. Featuring as the co-main event Current WBF Welterweight Champion James Onyango will defend his title against Jason Bedeman in a captivating 12-round match. The second co-main event of the night will be WBF World Flyweight title fight between Jackson Chauke and Immanuel Joseph. As a treat to boxing fans the MAC Series is proud to host Hall of Fame Boxing Champion Winky Wright as a commentator for American live TV streaming. Mr Wright will also be taking the opportunity to connect with South Africa’s roots, he will visit the Late Former President Nelson Mandela’s home and some of Johannesburg’s noble orphanages. The MAC Series will be streaming live to 32 countries through FITE TV app, tune in and enjoy the experience of these spectacular fights. Available Now: Purchase your MAC Series fight night tickets at the Big Top Arena, Carnival City Brakpan. We look forward to hosting you. Bigger Than Life Entertainment Corporation is a full-service entertainment company specializing in Concert Promotion, Public Relations and Artist Management. BTLE places Sports and Entertainment celebrities at major events worldwide and offers sports tickets and packages in Las Vegas, across the U.S. and internationally. Material Courtesy of Latoya Karwigi Used with Permission. For more information about Fite.TV, The Fite TV app, a list of compatible streaming devices, and to order The Mac Series: Making A Champion please visit: www.fite.tv. August 18th featured two bouts in Boxing’s Heavyweight division, which depending on one’s perspective could impact the division in the months to come. Two fights that featured a former world champion and a top contender and former world title challenger each looking to rebuild their respective careers and improve their standing in the Heavyweight division. The first of these bouts took place in Belfast, Northern Ireland at Windsor Park where undefeated former unified IBF/WBA/WBO/IBO Heavyweight world champion Tyson Fury faced veteran Francesco Pianeta. For Fury, this was the second fight in a comeback that began earlier this year following a near three-year layoff due to a plethora of personal problems. In the first fight of his comeback Fury faced veteran Sefer Seferi in June in Manchester, England. Despite getting the victory via a stoppage after four rounds, Fury faced very little resistance and frankly, the bout did little to answer questions regarding Fury after such a long absence from active competition. Some may say however, that a fight that at times resembled what this observer has called a brisk sparring session, did serve a purpose in getting the fighter, in this case Fury, back in active competition while allowing him to work off some ring rust. Going into this fight the primary question I had in mind was whether Fury would face more resistance than was the case in the first fight in his comeback. Despite being more than willing to engage with the former world champion and attempting to apply consistent pressure on him throughout, Pianeta simply could not land anything significant as Fury used his longer reach and lateral movement to evade most of Pianeta’s offense and outbox him to earn a convincing ten round unanimous decision. While this fight had all the look of one that was a mere formality and did not feature any of the characteristics that most would consider an exciting Heavyweight fight, Fury’s performance was something that Boxing fans should take notice of. Fury is after all coming off of an extended absence from the sport and even though I felt that if he wanted to press the issue more that he could have stopped Pianeta as the fight progressed, it was clear that Fury had a fight plan in mind and executed that plan to near perfection. What should also be taken into account is the importance of a fighter’s ability to go rounds and extend themselves into the deep waters of a fight. This ability is not only used as an evaluation of a fighter’s stamina, but also, an evaluation for a fighter’s team to use to determine when that fighter is ready to increase the quality of opposition in future bouts. For the former world champion, his next fight will come before the end of 2018 as Fury will attempt to become a two-time world champion when he faces longtime undefeated WBC Heavyweight world champion Deontay Wilder in a fight that will take place in Las Vegas, NV that will headline a card that is tentatively scheduled to be televised in the United States on Showtime Pay-Per-View. While some may question whether the thirty-year old former champion is ready to go right back in against one of the top fighters in the division after only two fights since his comeback began, before taking a hiatus from the sport Fury was at the top of the division having dethroned longtime division kingpin Wladimir Klitschko in November 2015. Although it is understandable how some both within the sport and Boxing fans might have a difference of opinion on this subject, it is also understandable how some might have the philosophy that after two one-sided wins against over matched opposition, there may not be a point in Fury fighting more fights that would ultimately be regarded as “Tune-Ups” and the true test for Fury will come when he faces a fighter that is currently at the top of the division. While yours truly looks forward to sharing more thoughts once the fight is formally announced, a date is set, and as we get closer to that date, in Deontay Wilder, Fury will face the longest-reigning current world champion in the division, who has the size and skill to potentially give Fury trouble and a fighter who has knocked out every opponent he has faced. Simply put, outside of an encounter involving undefeated IBF/WBA/WBO/IBO world champion Anthony Joshua to determine an “Undisputed Heavyweight World Champion” a fight between Wilder and Fury is likely one that will draw the most interest of fans and experts alike across the globe. With Tyson Fury having thus far shown he is still a player in the division, another fighter who has been a top Heavyweight contender in recent years has also been going through a rebuilding process. Bryant Jennings. Jennings, who emerged on Boxing’s radar in January 2012 in winning the Pennsylvania state Heavyweight championship with a decision win over Maurice Byarm, gradually worked his way through the ranks to earn an opportunity at a world championship when he faced unified IBF/WBO/WBA/IBO Heavyweight world champion Wladimir Klitschko as an unbeaten challenger in April 2015 in New York’s Madison Square Garden. In a highly competitive fight where he made a good account of himself against the longtime Heavyweight world champion, Jennings came out of the bout on the losing end of a hard-fought twelve round unanimous decision and had suffered the first loss of his career. Jennings would go on to suffer a second loss in his next fight following his loss to Klitschko when he was stopped by then unbeaten longtime top contender Luis Ortiz in December of that year. Although it might be tempting for some to write a fighter off after suffering back to back losses, Jennings in defeat was very “Game” against both Klitschko and Ortiz. The rebuilding process for the Philadelphia, PA native Jennings began in August of last year with a second round knockout of Daniel Martz. Jennings was able to follow that victory by compiling a run of three more wins leading to his encounter against fellow veteran contender Alexander Dimitrenko at the Ocean Resort and Casino in Atlantic City, NJ. In slight contrast to the comeback of Tyson Fury, Bryant Jennings came into his bout with Dimitrenko having compiled four victories in a relatively short period of time. While Fury was able to work himself back into contention for an opportunity at a world championship in just two fights, Jennings was not fighting for an opportunity at a world championship on August 18th, but was rather looking to continue building momentum by facing a fighter in Dimitrenko, who himself had experienced some setbacks throughout his career creating what some might argue was a crossroads scenario for both fighters. Dimitrenko came into the fight with Jennings with a respectable record of 41-3, with 26 Knockouts and had previously held the European Heavyweight championship as well as international and intercontinental championships recognized by both the International Boxing Federation (IBF) and World Boxing Organization (WBO) in his career. Despite the solid resume and experience Dimitrenko had accumulated throughout his professional career, he had failed each time he had attempted to step up in class in terms of competing on the world level of the sport suffering losses to former world title challengers Eddie Chambers, Kubat Pulev, and former WBO Heavyweight world champion Joseph Parker. While it might have appeared as though Jennings would have a slight edge prior to the fight, this was in my eyes in reality an encounter between two fighters at similar stages in their careers and this appeared as though it would be a more evenly matched battle than some might have anticipated. What I tend to look for in fights like this is to see if the talk that takes place prior to the fighters facing off will somehow influence how the two combatants approach the fight. This was a fight between two men who had shown the ability to be tactical boxers as well as an ability to get an opponent out of there should the opportunity present itself. Based on this as well as the skill level of the two fighters, I felt this fight could be fought as both a tactical Boxing match or more of a brawling type of battle where the question of who would come out on top would perhaps come down to which fighter had more stamina, particularly if the bout would extend into the later rounds. While Dimitrenko had some success throughout the fight particularly in landing his right hand and scoring a knockdown on Jennings in the fourth round with an overhand right that appeared to land on the back of the head, Jennings was able to control the pace of the combat throughout, have success with his own right hand, and pick his shots. Jennings avenged the knockdown he suffered in the fourth round by scoring two knockdowns of his own in the eighth round, the first courtesy of a flush left hook to the head of Dimitrenko. With his opponent hurt and being gradually broken down over the course of the fight, Jennings closed the show landing a flush right uppercut that sent Dimitrenko down to the canvas for a third time and caused the fight to be stopped. Now with five consecutive wins in his comeback and scoring four of those five wins by knockout, Bryant Jennings has himself re-entered the mix in the Heavyweight division. A question that will be answered in time is where Jennings will go from this fight. While Jennings did score an impressive knockout win over Alexander Dimitrenko in exciting fashion, the upper echelon of the division would appear to be occupied for the remainder of 2018 with both undefeated world champions Anthony Joshua and Deontay Wilder scheduled to defend their respective portions of the World Heavyweight championship in the coming months. Joshua will defend his unified IBF/WBO/WBA/IBO crown on September 22nd against longtime top contender Alexander Povetkin at Wembley Stadium in London, England. The fight between WBC world champion Wilder and Tyson Fury, while not formally announced as of this writing could take place between the months of November and December. This would leave other possible challengers including Jennings on the outside looking in, in terms of fighting for a world championship in the near future. There is of course the possibility that Jennings, who is currently rated number eleven in the World Boxing Association’s (WBA) Heavyweight ratings could be a potential option for the winner of upcoming bouts such as the October 6th clash between undefeated top contender Jarrell Miller and former two-division world champion Tomasz Adamek or the recently announced bout on October 27th between former world title challengers Kubat Pulev and Hughie Fury. While the bout between Pulev and Fury will determine a mandatory challenger in the International Boxing Federation’s (IBF) Heavyweight ratings and the winner will obviously be in line in theory of facing the winner of the Joshua-Povetkin championship bout, I believe Jennings could be a viable option in the event that the winners of the upcoming Heavyweight world championship fights opt to turn their attention to each other to determine one world champion in the division. With several possible scenarios that could play out for the remainder of this year and into 2019, the Heavyweight division is certain to remain a topic of both discussion and debate among Boxing fans and experts. Part of the fun of the sport of Boxing after all, is seeing how such scenarios play out over period of time. We will have to wait and see what happens for the Heavyweights next. Press Release: August 20, 2018 by Team Moloney Boxing – WBA #6, IBF #3, WBC #4, WBO #9 Australian Boxing sensation Andrew “The Monster” Moloney 17 – 0 returns to the ring September 8th for his 3rd fight of 2018 & the biggest challenge to date of the 27 year pugilists career. The bout will be at the Grand opening of the new lavish Bendigo stadium in Victoria Australia. Moloney is confident ahead of his WBA Oceania Super Flyweight title defense against “El Nica” Luis Concepcion. Concepcion a former 2 weight division WBA World Champion himself, a national icon in Panama. This will mark Moloneys 9th WBA Oceania fight in the Bantam & Super Fly divisions. “I know people say this all the time, but this really has been the best training camp of my career. We have flown in 4 international sparring partners for this camp and they have been great in helping me prepare for this fight as all of them have a similar style to Luis Concepcion. My coach Angelo Hyder and I have watched a lot of Concepcion’s fights and have put together a great plan for this fight. Concepcion applies a lot of pressure on his opponents and throws a lot of punches. We realise that I need to be extremely fit for this fight and that is why I am training so hard. Concepcion was the last man to hold the WBA Super Flyweight Title before the current champion Kal Yafai. I want to show everyone what level I am at by beating Concepcion and then we will set our sights on Yafai next. The man known as “The Monster” has been gunning for the WBA World Super Flyweight Championship opportunity against Kal Yafai for well over a year. All the top rated fighters refused to take on Moloney. Concepcion has stepped up to the plate and will come to Australia. 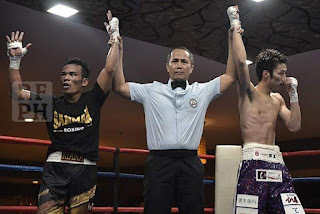 Concepcion was last tasted defeat September of last year against Mexican Iran Diaz who is now challenging WBC Super Flyweight Champion Wisaksil Wangek. Concepcion is eager to get back in the win column. “My rival is undefeated, but by reviewing his record he has not had the same opposition that I have faced in my career. I already studied it and we know what we are going to do in Australia, fighting inside or outside we have things clear” Concepcion added. “I’m motivated to win the fight and seek to crown myself again, I do not trust the opponent, but I’m sure of the work we are doing to get out with the hand up,” Concepcion said. The winner will be right in the mix for the World Title opportunity and will make an excellent match with fight of the year written all over it. Material Courtesy of: Team Moloney Boxing/Photo Courtesy of: Gary Farmer Used with permission. 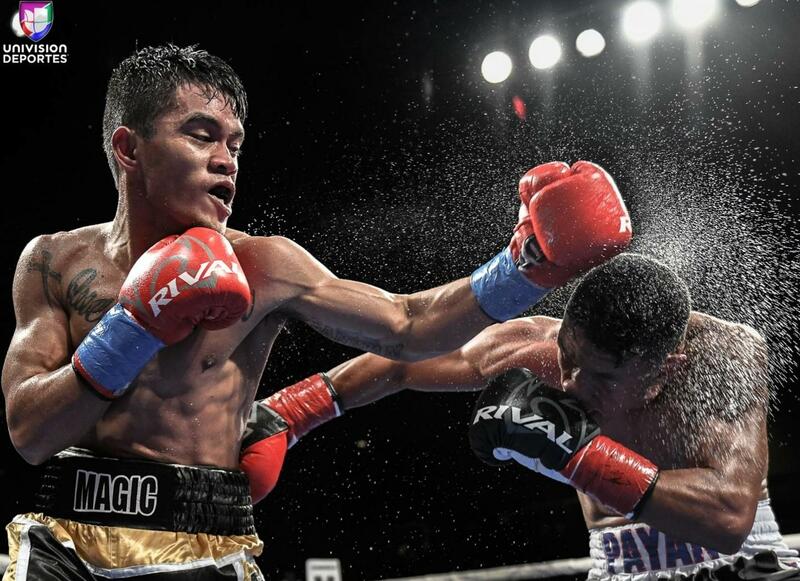 Press Release: August 20, 2018 (Originally released August 18, 2018) by Sanman Promotions – “Magic Mike” Plania (W15 8Kos L1 D0) gets the chance to be added into the Sanman roster of champions as he battles fellow Filipino Joan Imperial (W14 L7 D6) for the vacant WBC Asia Silver Super Bantamweight Title on September 9, 2018 in Polomolok South Cotabato. Plania is back on track with his latest KO win against John Rey Lauza. His lone loss was a closedecision against Juan Carlos Payano. In the co-featured title bout, unbeaten Dave Apolinario of Sanman/Pelayo Boxing (W7 KO5 L0 D0) will trade mitts with Michael Camellion for the WBC Asia Youth Flyweight Title. On the undercard, undefeated Jasur Akhmadjonov of Uzbekistan will battle it out with Nelson Tinampay in a10 rounder welterweight showdown. Another unbeaten Uzbek Ulugbek Sobirov will clash it out with Dondon Sultan in the super welterweight limit. Both Uzbek stars are managed by Vikram Swapragasam. Sanman Promotions honcho Jim Claude Manangquil who manages and promotes both Plania and Apolinario guarantees a night of non-stop action. “I am doing my best to stage great fights and produce more world champions. This event featured two title bouts in one night. You should not miss it”, Manangquil stated. The bouts will be viewable live on Facebook via Sanman Live. Undefeated International Boxing Federation (IBF) number one Jr. Featherweight contender TJ Doheny scored a hard-fought twelve round unanimous decision over IBF Jr. Featherweight world champion Ryosuke Iwasa on Thursday night at Korakuen Hall in Tokyo, Japan. A rarity in the sport of Boxing where two southpaws faced each other for a world championship, the bout was a tactical, but entertaining fight where both fighters had periods of effectiveness. Doheny suffered cuts under both of his eyes in the first two rounds of the fight, but it was unclear to this observer as to whether the cuts were caused by punches or clashes of heads. This was due to Doheny’s shorter height as compared to the champion and his head movement as he came forward. Despite bleeding from both cuts throughout the fight, the challenger was consistently aggressive and brought the fight to Iwasa. Doheny had particular success in being able to land his left hand in variations throughout the bout. This was a fight however, that was more dictated by moments in that there were several rounds where both fighters had success and this created a very difficult fight to score. The champion was most successful during periods where he was able to use his jab and near 5’8 height to keep Doheny at distance as well as having success of his own in landing his left hand and had periodic success landing punches to the challenger’s body. Iwasa was also successful in almost completely nullifying Doheny’s offense whenever the 5’5 ½ challenger would get in close. Although the physics of this fight as well as certain periods throughout the bout would indicate and give the impression that the advantage was in Iwasa’s favor, Doheny’s aggression, ability to land his left hand consistently with hooks and overhands as well as his ability to make the champion miss with his head movement in addition to finding a home for his own jab throughout became the story of the fight in my eyes. The challenge as I have said frequently over the years with regard to close fights where both fighters have success in the same rounds is to distinguish which fighter is able to make the most of their periods of success as compared to their opponent that more often than not will determine who will get the upper hand in terms of the scoring of the fight. While Iwasa was the more accurate fighter throughout the fight and controlled the combat in close, Doheny dictated the tempo and was simply the effective aggressor. If there is one criticism that some might point to about Doheny’s performance in this fight, it was his inability to let his hands go on the inside where it was theoretically to his advantage where Iwasa would be ineffective in using his longer reach. Despite this, Doheny was the fighter who more often than not forced the action and this in addition to the success he was able to have offensively throughout the fight allowed him to earn the twelve round unanimous decision. Official scores were: 117-112, 116-112, and 115-113. TJ Doheny advances to 20-0, with 14 Knockouts. Ryosuke Iwasa falls to 25-3, with 18 Knockouts. Unofficially, I scored this bout seven rounds to five in favor of Doheny. Although there are those who tend to put an emphasis on statistics in an age of ever advancing technology as sort of a way to gage who is more effective in fights that are fought like this, it is hard to argue if one views this fight objectively the subtle differences between the two fighters in a closely fought battle. From my perspective, Doheny’s success in not only landing his left hand, but landing it cleanly throughout as well as his defensive prowess as the fight progressed is what I based my score on in addition to being the effective aggressor. Featherweight Ryota Tsuchiya successfully made his professional debut by scoring a four round split decision over Takahiro Nakatsuka, who was also making his professional debut. Official scores: 39-37, (Two scorecards, one in favor of each fighter) and 39-38. Ryota Tsuchiya advances to 1-0, with 0 Knockouts. Takahiro Nakatsuka falls to 0-1, with 0 Knockouts. In the Jr. Bantamweight division Takuya Matsunaga successfully made his professional debut with a four round unanimous decision over the also debuting Soma Ikeda. Official scores: 40-36, 39-37, and 39-38 all in favor of Matsunaga. Takuya Matsunaga advances to 1-0, with 0 Knockouts. Soma Ikeda falls to 0-1, with 0 Knockouts. In the Flyweight division veteran Daisuke Sudo scored a six round unanimous decision over Jun Ishimoto. Official scores: 59-55, (On two scorecards) and 58-56 all for Sudo. Daisuke Sudo advances to 5-6-3, with 0 Knockouts. Jun Ishimoto falls to 5-6-1, with 3 Knockouts. In the Lightweight division undefeated prospect Shawn Oda continued his winning ways with a third round stoppage of Masashi Wakita. Official time of the stoppage was: 1:31 of round three. Shawn Oda advances to 9-0, with 8 Knockouts. Masashi Wakita falls to 8-8-2, with 3 Knockouts. Former Oriental Pacific Boxing Federation (OPBF) Flyweight champion Koki Eto, now competing as a Jr. Bantamweight scored a sixth round knockout over veteran Delfin de Asis. Official time of the stoppage was 1:14 of round six. It will be interesting to see what both TJ Doheny and Ryosuke Iwasa do coming out of what was a highly competitive world championship fight in the 122lb. Jr. Featherweight division. While it is too soon to speculate on a potential rematch between the two, this observer feels a second encounter is warranted due to the close nature of the fight they put forth. Sometimes when there is such a close fight and opinion might differ as to the outcome, the only logical answer to appease critics, fans, and even the fighters themselves is to do it again. The official weigh-in for Thursday’s twelve round International Boxing Federation (IBF) Jr. Featherweight world championship fight between defending champion Ryosuke Iwasa and undefeated IBF number one contender TJ Doheny took place earlier today in Tokyo, Japan. The defending champion, who will be making the second defense of his world championship came in at an official 121 3/4lbs. while the challenger weighed in right at the Jr. Featherweight limit of 122lbs. Iwasa vs. Doheny will headline a five-bout card at Tokyo’s Korakuen Hall. Iwasa vs. Doheny takes place tomorrow night (Thursday, August 16th) at Korakuen Hall. The fight can be seen in the United States on the new digital streaming network from ESPN, ESPN+ beginning at 6:45AM ET/3:45AMPT (Thursday morning U.S. Time.) ESPN+ is available through the ESPN app for $4.99 a month or $49.99 per year. To subscribe to ESPN+ Click the ESPN+ tab within the ESPN app or visit:watch.espnplus.com/sports/ to subscribe as well as for a list of available streaming devices carrying the ESPN app. For more information about ESPN please visit:www.espn.com. Check your listings internationally. We would like to let our readers know that new material will be released on Wednesday, August 15th during the evening hours. Stay Tuned. "And That's The Boxing Truth." Press Release: August 7, 2018 (Originally released August 6, 2018) by Dragon Fire Boxing – WBA World #15 Light Heavyweight Reagan “The President” Dessaix (14-1) returns this Saturday August 11 in the Co Main Event of the Boxing Mania 3 Event at the famed Seagulls Club in NSW. The Australian reality TV star from hit show “Seven year Switch plans to impeach “The President” having vowed to leave everything in the ring this Saturday. “It’s Been a great training Camp from start to the near finish now! Really been focusing on my Strength & Conditioning, also a lot of skill work this camp so looking forward to putting it all together on Boxing Mania 3 ! This Camp I’ve aimed to spar taller & rangier guys as my opponent is about the same height & build as me. I’ve done a heap of rounds with my stable mate 91kg Cruiserweight - David Hadfield. Also a lot of rounds with Benji “Koski” Dimitrioski & Josh “Hanibal” Frederiksen. Strengths - His been in with the best & has dodged nobody in Australia. But he should of stuck to Reality Television, because August 11th his going to find out what the reality of Boxing’s all about! Weaknesses - I’ve already identified many weaknesses in my opponent & looking forward to exploiting them this weekend! We’ve done a lot of research on his style. His long & rangy like me. But my team have put together a great game plan to outsmart & out skill him on the night ! Looking forward to putting it all together come August 11th. Dessaix has big plans for the Light Heavyweight Division, “It’s always been a childhood dream since I was young to become a World Champion and still is my dream ! I know it’s a long road but Winning the WBA Oceania Title takes me a step closer to that childhood dream. I feel honoured to hold such a prestigious title. “This weekend I look to put on a boxing clinic & send a big message out to everyone else in the division that I am the real deal! “ state “The President. 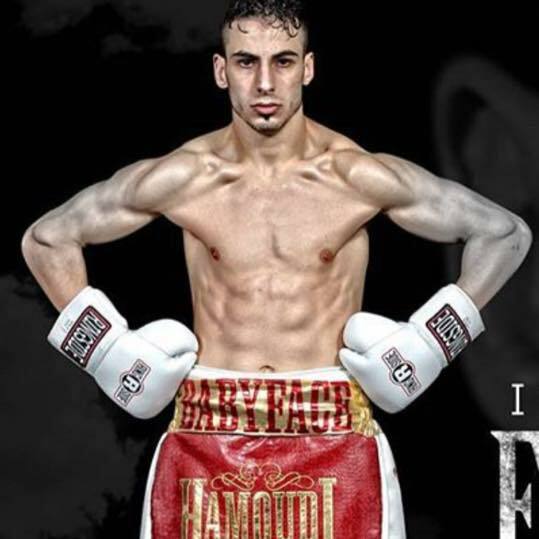 The Co Main Event sees former World Rated Super Featherweight “Baby Face” Billel Dib (21-3) takes on WBA Oceania Super Featherweight Champion Bruno Vifuaviwilli (21-1-1) in what is expected to be an absolute war in the rematch from their controversial March 24th fight. Press Release: August 4, 2018 by Sanman Promotions – Sanman Boxing Gym's Jayson Mama and his Chinese foe Yinjuan Su made weight for their all-important showdown in the IBF Silk Road Tournament tomorrow, August 5, at the Wynn Palace Cotai in Macau, China. 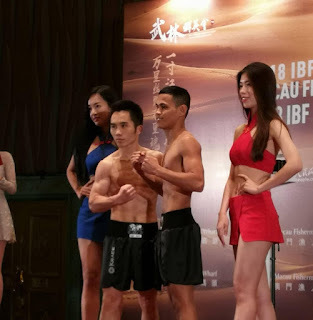 At the weigh-in held Saturday (August 4) noon at the Macau Fisherman’s Wharf Convention Center, Mama and Su both tipped the scales at 112 pounds. “I am ready. I didn’t have a hard time making weight,” said Mama. Sanman Promotions CEO Jim Claude Manangquil, who will be at ringside on fight day, is thankful that the day has finally come for Mama to showcase his immense talent. “We are confident for this fight. Jayson is a talented fighter and it’s his time to showcase it tomorrow,” said Manangquil. Mama is in his first overseas fight and the undefeated orthodox fighter vowed he will be up to the challenge. “Tomorrow, I will be more than 100 percent ready,” said Mama shortly after the weigh-in. The General Santos City-native Mama is still unbeaten in 10 fights and six of those wins were by knockouts. Standing in Mama’s way is Su, who has six wins, two losses and one knockout victory.